Since its inception in 2004, opensky has evolved to become one of the most pioneering IT solution companies in the marketplace. With offices in Ireland and Poland, we have the ability to equip businesses (in both public and private sectors), with innovative customised IT solutions and managed services, providing our clients with a path towards increased cost-efficiency, productivity, and revenue optimisation. opensky has extensive experience in designing, building, implementing and supporting management information systems and business intelligence solutions along with our core competence of custom software and applications. This expertise allow organisations to manage, analyse and report on critical aspects of their business data.The company offers value through excellence in technical design, a flexible, reliable, client-centred approach and high quality performance. With special focus and experience in Health, Transport, Environment and Retail system development, the company is equipped to solve the most complex of data and technology challenges. opensky has worked with Irelands National Health Service for several years and developed a suite of unique e-Health applications. We have worked with universities who are involved in medical research. A member of the European Connected Health Alliance (ECHA), opensky will play an integral part in the development of e-Health and Health Informatics Solutions both in Europe. 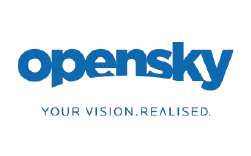 Today opensky is the premier provider of management information solutions for multiple sectors including:Public, Health & Social care, Transport, Waste & Environmental, Retail & Manufacturing, Food & Agriculture, Charities & Non-profit, Higher Education & Research and Financial.